I don’t like to dwell on the foods that are excluded from my diet due to annoying intolerances, but the inconvenience of having to give up most commercial dips because of chick peas, cream cheese and/or garlic leaves me no alternative but to make my own. This FODMAP friendly eggplant dip was a happy accident. Posting a recipe to Please Pass The Recipe was the furthest thing from my mind when, in a rush and limited to gut friendly ingredients I threw it together. After tasting the dip to check the seasonings I decided it was just too good to ignore, jotted down the recipe and snapped a few photos with my phone. I served the dip warm with homemade sourdough flatbreads. I’ll tell you about them in another post soon. 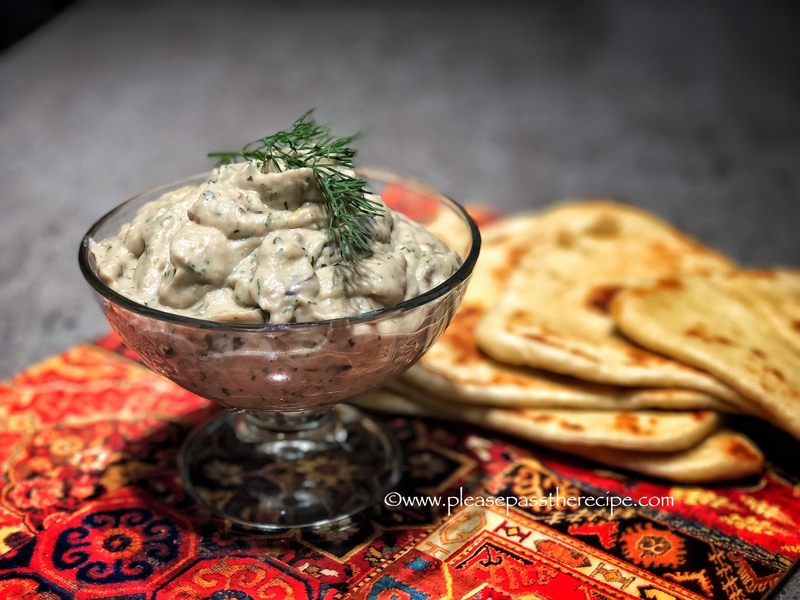 My lazy method, almost instant FODMAP eggplant dip is seriously good, super creamy and oh so moreish. Wash the eggplant then prick the skin all over with a sharp knife. Cook the eggplant in the microwave for 4 minutes on high then seal in a container with an airtight lid for 10 minutes to steam. Roughly chop the eggplant and put it into the food processor with the olive oil. Process until reduced to a creamy consistency. Add the dill, salt and pepper and yoghurt and process to a thick cream. Wonderful served immediately while still warm. Love your recipe!!! Will try soon. First of all, I love your new photo! Secondly, I’m sorry you have these allergies/intolerances, but like you said, you have to deal with them. This dip sounds wonderful! Aw thanks Mimi, it’s a rare thing to have a flattering photo. A classic! And it’s been a long time since I made this… have to get back to it. The first recipe for an eggplant spread I ever had included these ingredients, except the dill, which is very appealing. I’m going to try the aubergine cooking technique too. So good! We make a Greek eggplant dip called melitzanosalata 🙂 Eggplant is delicious! 🙂 Thanks for sharing your recipe. My kind of whip up! Love quick fixes, thanks. Clever you working around food intolerances, it is always an interesting challenge. We love Baba Ganoush, so this is perfect. I too think the dill is a great addition. Must make this soon. Nice – I particularly like the addition of dill to this dish. I made a similar sort of thing, without the yoghurt, but simply whip the smoky roast aubergine with good olive oil, salt, pepper and a bit of oregano. Will be adding dill instead next time. Good idea – that is keeping the oil level down! Num num! I’m going to copy your ingredients but do half with dill and half with some Ras Al Hanout. Like your eggplant cooking technique! This entry was posted on January 18, 2018 by ladyredspecs in Cooking, Dips and Spreads, FODMAP diet, Food, recipes, side dishes, Snacks and tagged dip, eggplant, FODMAP diet, gluten free, yoghurt.